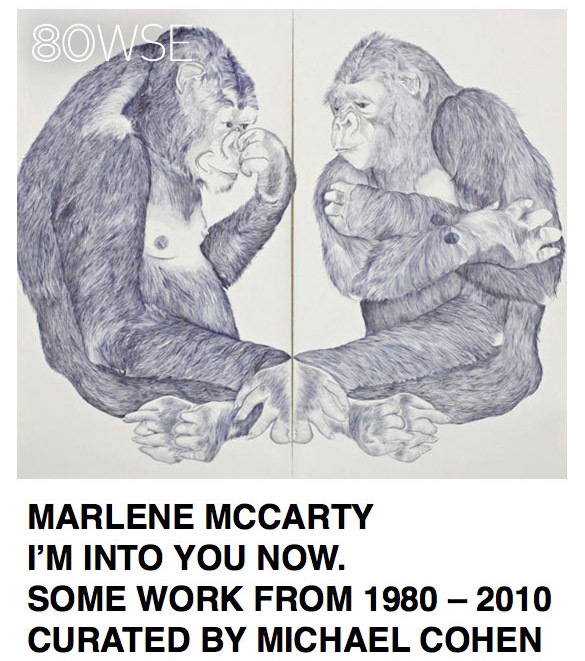 NEW YORK, Oct 26, 2010 / — 80WSE Gallery presents “Marlene McCarty: I’m In To You Now” art exhibition featuring some of the artist’s work from 1980 – 2010. The exhibition includes McCarty’s rarely seen early 90’s word paintings and matchbook sculptures, 16 never before exhibited house drawings and four new large-scale landscape and figurative drawings. Curated by Michael Cohen, the exhibition is open from Nov 2 – Dec 18, 2010 at the 80WSE Gallery located at 80 Washington Square East between West 4th Street & Washington Place in New York City. Marlene McCarty, born 1957, is a visual artist who works across media in New York City and Europe. She studied at the University of Cincinnati, College of Design, Architecture, and Art (1975-1977) and at Schule für Gestaltung, Basel Switzerland (1978-1983). McCarty was one of the American representatives to the Istanbul Biennial for 2003. This Instanbul installation was also shown in 2004 at the Brent Sikkema Gallery (New York). McCarty’s works have been shown galleries in Los Angeles, Berlin, Vienna, Madrid, St. Petersburg, Russia, Dublin and Basel.